#340) Science Communication Rebellion in Seattle! It’s a generational thing. I’ve seen it for years now. The old farts just don’t get it. So a group of grad students at Univ. of Washington have decided to take things into their own hands. YAY! This is what I admire — INITIATIVE! Here’s their crowdfunding link. I gave them some bucks, you should, too! FUND THIS! FUND THIS! FUND THIS! Come on, a few bucks will go a long ways with this group. 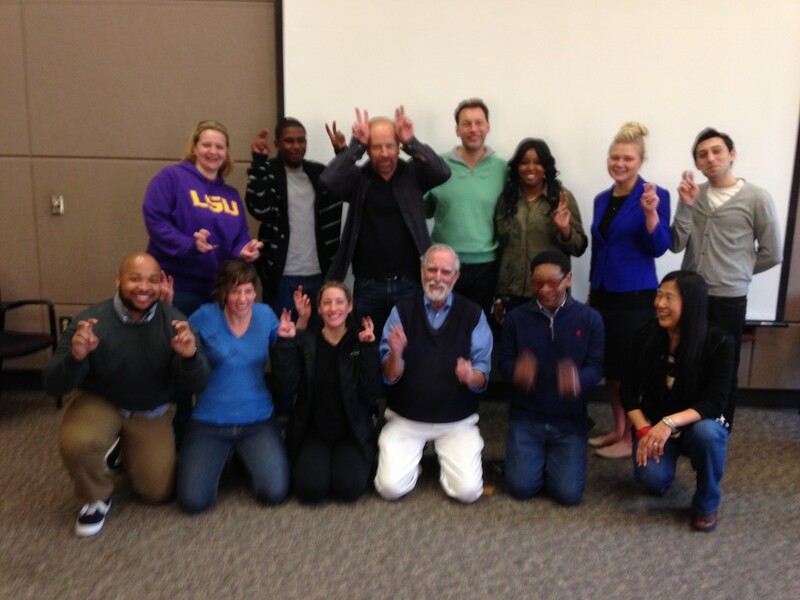 This is REAL communications training. Now a group of grad students at U.W. have decided they can’t afford to wait for the retirements. They have organized themselves and launched a small crowdfunding project to support their Engage Program to improve their communications training. Of course I’ve been seeing this pattern for years with every one of my university visits — eager eyes and ears from the graduate students who are all fluent in Facebook and Twitter, but a majority of faculty who don’t come to my talks and think I’m a public nuisance. It’s no surprise to me. I’ve been to the mountain top — the leadership is lacking — you really do need to take things into your own hands if you want to do interesting things. So a HUGE thumbs up to these folks. I spoke last week with Jessica Rohde, one of the organizers. Just to prove she has good communication skills (which means knowing the proper “channels” of communication to use with a specific audience) she put their message into the language of our Connection Storymaking Workshop (which, btw, we’re running this weekend at the Ocean Sciences Meeting in Hawaii!). Here’s their overall agenda in the WSP form (though the paragraph doesn’t really use the Logline Maker template which just means they need us to come to town soon and run our workshop!). Sentence: Science graduate students want communication training AND in today’s world they need it, BUT institutions don’t provide it and advisors think it’s a waste of time, THEREFORE to convince them that it’s not, we’re quantifying the ways that communication training benefits scientists. Paragraph: Today’s science grad students crave communication training. They know that if they want their work to impact society, they need to be able to explain its importance to decision makers and the public. But the demand for training in science communication far surpasses the supply. There are two major roadblocks: most institutions don’t offer communication training, and even when they do, faculty prefer their students to stick to research, seeing such training as a waste of time. At the University of Washington, a group of frustrated and ambitious grad students decided to stop waiting. Without any funding or support, they created their own science communication training program called Engage. They were hugely successful. Four years later, all Engage students give public talks on their research at Town Hall, and the UW has endorsed the program and provided funding. Now, it’s time to scale up. The Engage Program wants to help the many grad students who are still waiting for their institutions to supply what they demand, and waiting for their advisors to see the value of communication training. To convince the institutions we will have to speak their language. 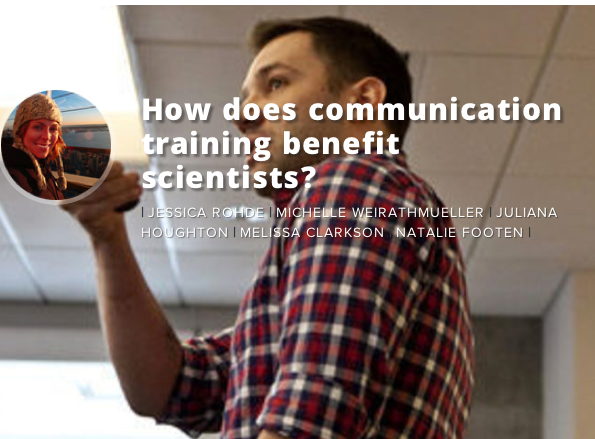 We want quantify how communication training has made Engage students better scientists—their writing and speaking ability, collaborations across disciplines, and leadership opportunities—and give grad students the leverage they need to change the system. We’re crowdfunding this research at microryza.com/engage. Join the rebellion–donate what you can, $5 or $500, and give these ambitious young scientists a platform and megaphone to demand their communication training. 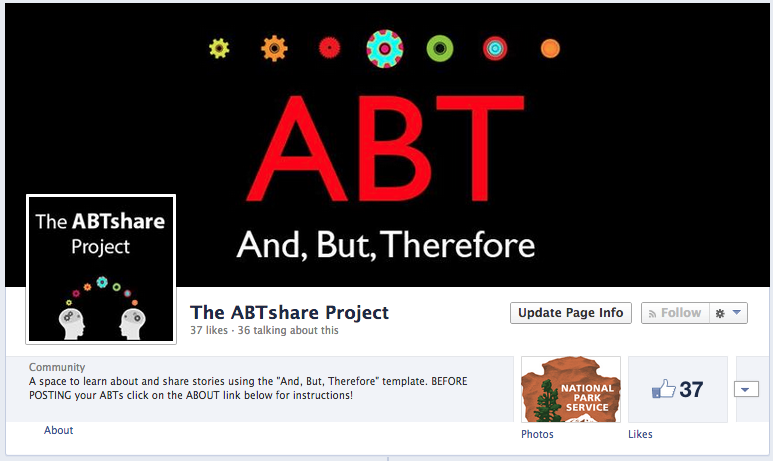 If you haven’t yet, be sure to check out our #ABTshare Project at facebook.com/ABTshare! If we can put our faith in the metric of the IMDB Pro Starmeter, then I need to modify yesterday’s blogpost with the updating of the Starmeter scores (which happens on Mondays). I stick with what I said about Bill Nye being the net winner. But it appears to be a measurable fact that the cheeseball creationist, Ken Ham, benefitted hugely from the media exposure. Just look at the numbers below. EENIE-MEANIE-CHILLI-BEANIE, HERE IS YOUR STARMETER RATING! Who knows how they come up with these things. I searched a few forums and read a few people speculating about it. I’m sure you can find out somewhere. It’s not a precise science, but there is a fair amount of validity to it. My film school classmates all have Starmeter ratings that match their level of success pretty closely (I’m way the hell down about a couple bazillion so I know it’s accurate). The key thing is it probably doesn’t really mean much until you rise above 10,000, as Bill Nye clearly has for at least the time being. 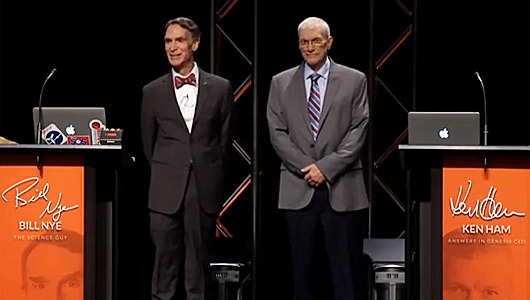 Evolutionist Jerry Coyne wrote an editorial in the New Republic in early January suggesting that Bill Nye would be “helping the discredited creationists he’s planning to debate.” Well, did he? The answer is pretty clearly yes. Look at the huge jump that Ken Ham took in his IMDB Pro Starmeter rating. And really, all that is showing is what you can already guess from the level of exposure the event received (it was all over USA Today’s website). There’s no doubt Nye served up a huge validation to Ken Ham, who just two weeks ago was as marginal as his 140,000 previous score reflected. It’s very easy to shoot holes in the Starmeter rating — most actors find it frustrating trying to figure out exactly what it’s based upon. But there’s no denying it is a fairly accurate overall reflection of how “hot” someone is in the media world. It’s probably about as reliable as the scores on Rotten Tomatoes for movies — you get the occasional baffler, but most of the time the score is pretty close to reality. Regardless of whatever bump Ham received, look at where Bill Nye has reached. In fact, Alan Alda (the Great White Science Hope) this week dropped to 3,096, meaning that Nye is just about on par with the 6-time Emmy winner. Bottom line, 3,000 is pretty huge. Anything above 10,000 is pretty huge. Bill Nye scored big with his debate adventure. And really, overall, as repugnant as some scientists may find creationists, they are an effective foil for reaching the general public. That’s just the way it works in the human race. Sorry. 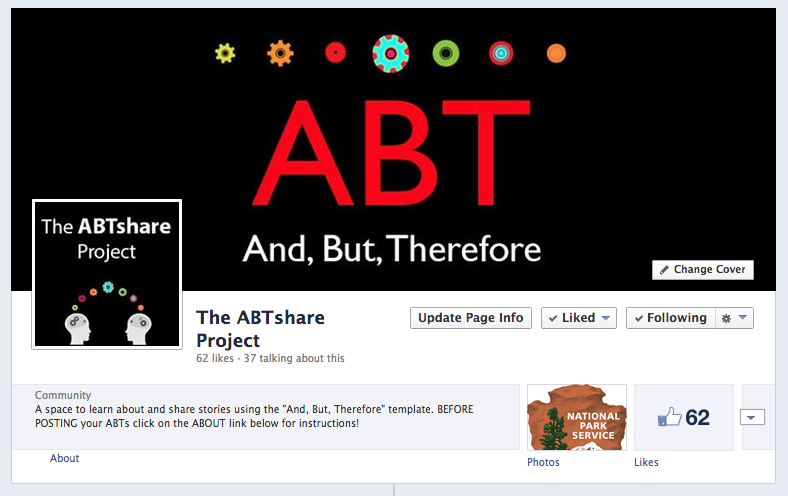 Aaaannnndd don’t forget to check out our new ABTshare Project at http://www.facebook.com/ABTshare! Learn your ABT’s and share your own stories with an audience. Bill Nye did just what he needed to do. The science world should set aside its relentless powers of negation for once and simply support his efforts to become a broad, positive voice for all things science. To all the bloggers who said he “lost” the “debate” — you’re being overly-literal minded (i.e. “such” scientists). 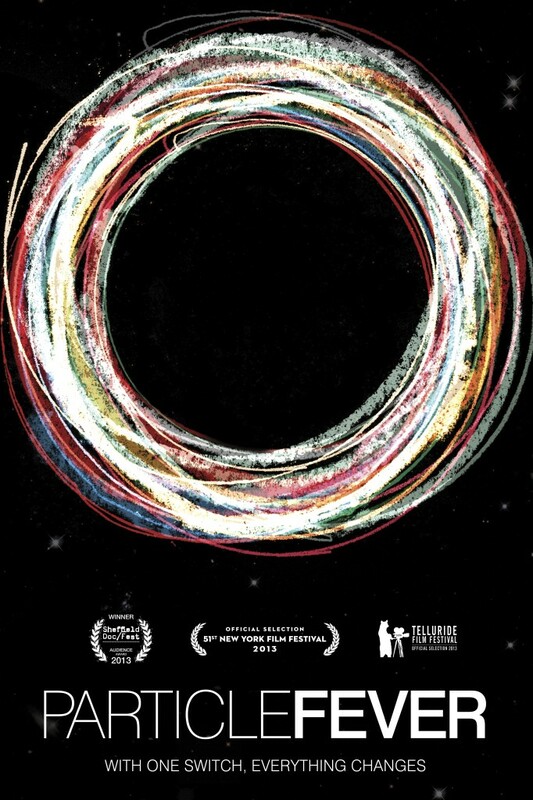 It’s that myopia that handicaps the broader communication of science in the U.S.
A STARMETER STAR IS BORN. Bill Nye’s IMDB Pro Starmeter rank is around 7,000, which is pretty good. Alan Alda is at about 1200, which is even better, but a lot of that is probably just from reruns of “Mash.” The science world needs a trusted and liked voice for the public. Bill Nye offers this. So there’s the first source of problems in this idea of “debating creationism.” There is no jugular. The contest is apples versus oranges. In fact, let me tell you the best quote I never managed to squeeze into my movie. It was from Bill Wagnon, a Kansas School Board member and professor of history at Washburn University in Topeka, who said the frustrating thing about the two sides of this issue is that they want to engage in battle, but can’t find a common battleground. He said it reminded him of 19th century Europe where the British navy wanted to fight Napolean’s army, but they couldn’t figure out where to meet. Which means there simply is no such thing as a “jugular” to go for, any more than a human could hope to slash the jugular vein of a ghost. Last Wednesday night pretty much neither side was listening, and it’s not clear there’s much of a “battleground” audience to be played for in the first place. Since 1982 the Gallup organization has been tracking the three main segments of the population who believe: A) God made it all, B) God helped, C) there is no God. The proportions are amazingly stable over time with a little over 40% for the first two groups, and a slowly growing number of people in group C, going from about 10 percent back then to roughly 15% today. Bottom line — it’s a pretty stable pattern over time. And it makes you realize the stakes are non-existent for any given “debate” between evolution and creationism. You might as well have a football player challenger a ping pong player to chess. It just isn’t a competition. However, there is a completely different perspective for this event, which is not substance but style. If you accept that we live in a society today where it matters far less what people hear than how often they hear it, you begin to grasp the power and importance of simply “having a voice” out in the mainstream media. 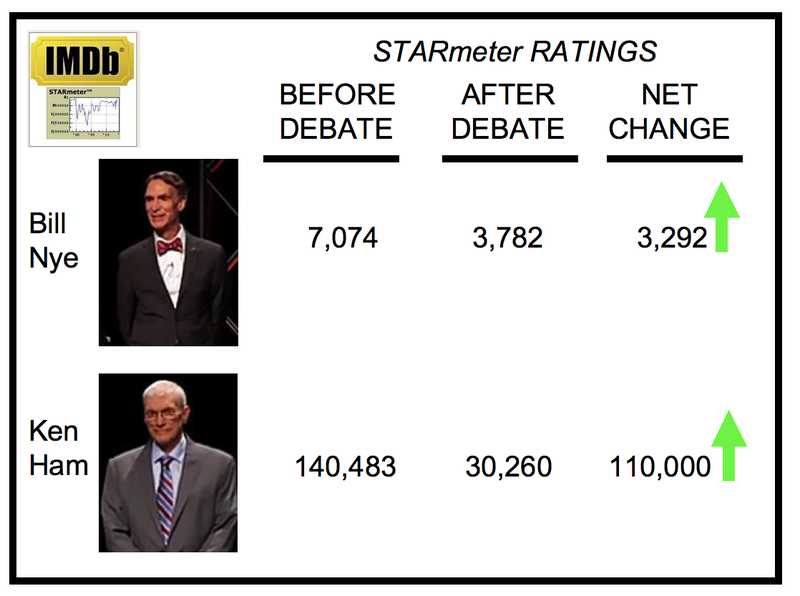 Towards that end, Bill Nye is beating Ken Ham by about 160,000 popularity points. That’s the difference right now in their ratings on the IMDB Pro “Starmeter,” which is the index Hollywood people use to figure out “who’s hot” in the media world. In those terms, Bill Nye is indeed hot, and getting hotter. And no one in the science world can touch him at the moment. His current Starmeter rank is 7,074. His closest science competitors are probably Neil deGrasse Tyson (roughly 16,000) and Richard Dawkins (around 44,000). Guess what that translates into—who do you think the current “go to” guy for climate debates on CNN and elsewhere is—it’s the guy with the best Starmeter rank. Of course Bill has been scorched more than once by trying to tangle with climate skeptic media machine Marc Morano, but for the most part, when you’re a minor media figure, exposure is exposure. And in the meanwhile, what about Ken Ham — the fellow many scientists were terrified Nye was assisting by helping him get recognition for his event. His Starmeter rank is a paltry 170,000. Nobody’s going to be giving him his own TV show any time soon. So the bottom line for the great “debate” is that it merely further stokes the media fire of Bill Nye. Is that a good thing? If you take a look at the commentary around Bill Nye’s appearance last fall on Dancing with the Stars, what you find is that the audience loved him. And given the generally good image of scientists in our society, you can assume they would trust him as well. The science world desperately needs a popular spokesperson. I could critique Nye’s specific style and even substance of the “debate” in great detail (i.e. the entire thing bored me in less than a minute), but that’s not what matters right now. He is pro-science, he’s smart enough, he has a rising star, and if the science world is smart, for once they will set aside their inexorable desire to negate ruthlessly and simply help him push that Starmeter score as high as possible. It’s about leadership in the media world, which is a topic that science is utterly clueless about. Bill Nye presents an opportunity for a much-needed voice at a crucial time for science. Towards that end, he was the clear winner Wednesday night. In other news, be sure to check out our NEW ABTshare Project! 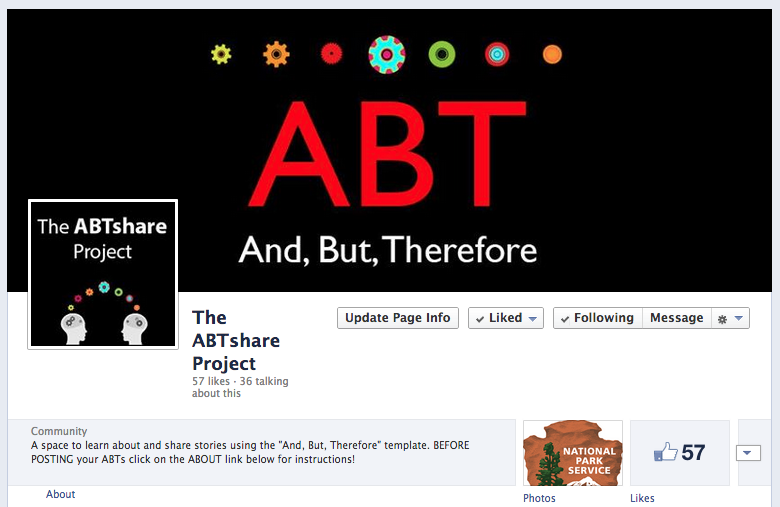 Learn about the ABT template, read examples and share your own ABT stories on our Facebook page at https://www.facebook.com/ABTshare. 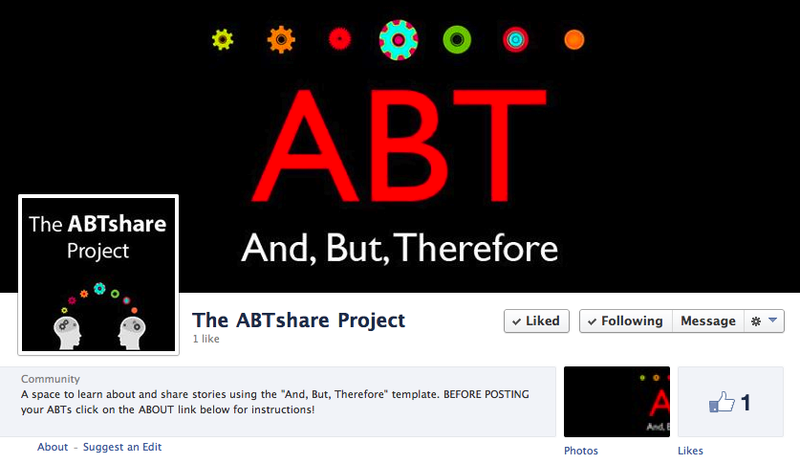 Lots of people are putting the ABT template to use AND are finding it to be a powerful tool for finding “the narrative” in any material, BUT reading other people’s ABT’s could be valuable in gaining a deeper understanding of it’s use, THEREFORE we have created a Facebook page where everyone can share their ABT’s! SHARE YOUR ABT’S. Got an interesting ABT? Please post it on our new Facebook page for others to read. Or read the ones that are posted. Last week, in the middle of our workshop with the National Park Service folks at the NCSE someone said, “Hey, you should have a place where people can share their ABT’s.” Which is something we had talked about last fall when we first released the app. The more we work with the ABT, the more impressed we are with it. Over and over again we’re finding it to be the most powerful tool for discovering the narrative spine of what you have to say. The best way to get a feel for it’s use is simply to read a bunch of them, as you can now do at this Facebook page. #335) Are Climate Skeptics Headed the Way of the Dinosaurs? I’ve been a limited fan of climate skeptics only in that they light a fire under the bloated American environmental movement. But an NPR segment last week asks whether their bus has now left the station with so many major corporations accepting climate change and working on the potential profit angles. Which is what I saw in Norway two years ago where they thought it was laughable that climate skeptics even exist. I think if I were a climate skeptic I’d start looking for a new cause. 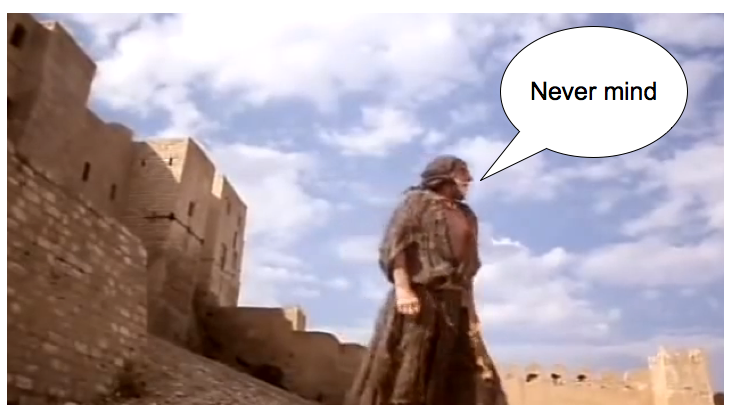 CLIMATE SKEPTICS HAD A GREAT RUN, BUT … I wonder if they aren’t ending up like the great scene in “Life of Brian” where everyone haggles about the meaning of the cast off shoe, until they all run away in a new direction, leaving this one guy behind, still trying to preach, but with no followers left. Kinda looks like the future for the climate skeptics. Warren Olney had a GREAT segment last week titled, “Cashing in on Climate,” on what I saw in Norway two years ago — that businesses can’t afford to be climate skeptics—they have long since been projecting their business plans based on the obvious patterns of climate change. This segment of KCRW’s “To The Point” presents exactly the same story. It tells about how long Shell Oil has been aware of and accepting climate change science, and even the big, bad Exxon Mobil is on board. All of which makes you wonder if the climate skeptic agenda isn’t about cooked. And overall, there’s a similar tone from the business community of, “Thanks a lot, dummies,” towards the climate skeptics in the same way that the Republican Party is projecting that tone towards the Tea Party these days. They all had a lot of fun, but ultimately fouled things up for the smart people of the business world. There’s reason to believe the mighty climate skeptics may be going the way of the dodo. Which is a little sad as I found them so entertaining, but such is the Darwinian process.